Anderson Cooper Makes his Comic debut! 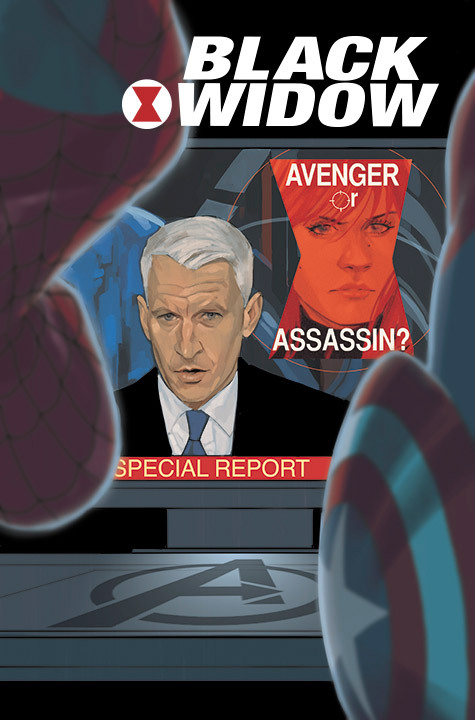 This November, CNN’s own Anderson Cooper makes his Marvel Universe debut for a special, Marvel Comics only, investigativereport that begs the question – is the Black Widow truly the Avenger we want? It all happens in BLACK WIDOW #12, as the world renowned journalist and news anchor exposes the tangled web of the Widow’s past discretions, courtesy of critically acclaimed creators Nathan Edmondson and Phil Noto. Though she now walks a righteous path in her quest for atonement, her past is paved with bloody memories. Though allegedly reformed, is a former KGB operative and assassin the right Avenger to protect the American people? Where do her allegiances truly lie? Those questions and more will be answered in November’s issue! Currently the anchor on CNN’s Anderson Cooper 360°, the Emmy Award winning Cooper has spent many years broadcasting from around the world, reporting on up-to-the-minute news and current events. Once a resident of the shadows, the Black Widow’s operations have been brought into the light like never before. With the investigation into her actions underway, what will the Avengers do when they learn how she’s been spending her days off? Find out when Anderson Cooper makes his Marvel Universe debut in BLACK WIDOW #12 this November!